I had travelled more than a thousand miles to be surrounded by people, yet there I was, alone on a hard red-dirt trail in the Santa Fe National Forest. To be clear, I was “alone on purpose,” as Nicole Morgan so deftly phrased it in her recent guest post. But following through on this intentional aloneness had taken great willpower. By choosing to set off solo on a hike that afternoon I was voluntarily leaving behind the potential of great conversations and new friendships—the very experiences I had in mind when I devoted a week of time and a sum of money to attend a Glen West writing workshop. Many people at the Glen arrive in search of space and time to think and write, but as a full-time solitary writer who longs throughout the year for “colleagues,” I went to the Glen to fill that space and time with people. I needed a break from being alone with my thoughts and words, and during my first three days there I had accomplished just that. The mornings’ inspiring conversations in my non-fiction writing workshop transitioned into lunch hours sitting with authors I’ve long admired. Afternoons spent around courtyard tables, hearing about writing projects others were working on, gave way to more conversations over dinner, followed by engaging author and artist talks. Each night found me fighting the need for sleep as the extroverts and night owls gathered for more talk and laughter over whisky or wine, late into the night. By that Thursday afternoon I had reached a state of “satisfyingly full” and knew some solitude (beyond the fast-asleep kind) would be good for me. It was one of those moments of awareness that separates childhood from adulthood: when you know that something—maybe eating those greens or getting up early to exercise—is important for your wellbeing, so you do it even though you don’t really want to. I didn’t really want to be alone, but I knew it would be good for me, so I set out on the nearby Atalaya Trail to see what gift Aloneness might have for me in the midst of so much togetherness. The hard-packed ground was dry and gravelly, a shade of burnt, orangey-red that might as well be called New Mexico Red. I passed by Juniper and piñon, cacti, yuccas, and sagebrush, breathing in a heavenly-yet-foreign blend of scents that added a new layer to my aloneness: I was alone in an unfamiliar land. I couldn’t remember what the bear saw, so I stopped singing and walking to just breathe—to calm the tinge of fear I felt and focus my mind on the quiet and the beauty that was all around me. After walking a bit further, I reached a trio of wooden plank steps that carried the trail up and over a gravel road. Turning around, I lowered myself onto one of the steps, opening my water bottle and taking in the view below, the path I had just walked. The college campus, where all of those conversations and friendships had taken root the days before, looked small, but there it was, waiting. For near is where you’ll meet what you have wandered far to find. 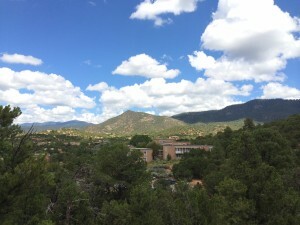 I had traveled all the way to New Mexico to be with other writers and artists—I needed new conversations and different perspectives to help reframe the story within me. Then I had traveled up this mountain for time and space alone, in a land so different from the one I know that I couldn’t help but be aware, notice, and respond—not intellectually but viscerally. And all of those miles, all of that wandering both with others and alone, had helped me meet what is very near, in my heart. 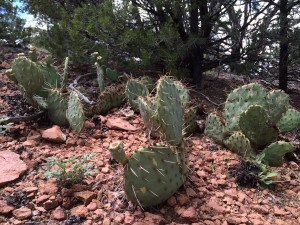 This entry was posted in Alone in Place and tagged alone, community, conversation, extrovert, far, fear, friendship, Glen Workshop, hiking, mountains, near, New Mexico, perspective, Santa Fe, Scott Cairns, solitude, travel, writers, writing. Bookmark the permalink. I think I might have past you on that trail. I, too, didn’t know how to balance all that is at the Glen! Will you be there this year?? Love this, Kristin. And I so relate to knowing that you need aloneness, even if it’s not exactly what you want. It’s like we’re real grownups or something! 🙂 Thanks for reading and commenting, Cara. beautiful. Laughed at your “bear went over the mountains” singing because I have on a couple of occasions found myself wandering into a place alone without any real safety plan for if something went wrong, and, well, singing works as a backup safety plan I guess.